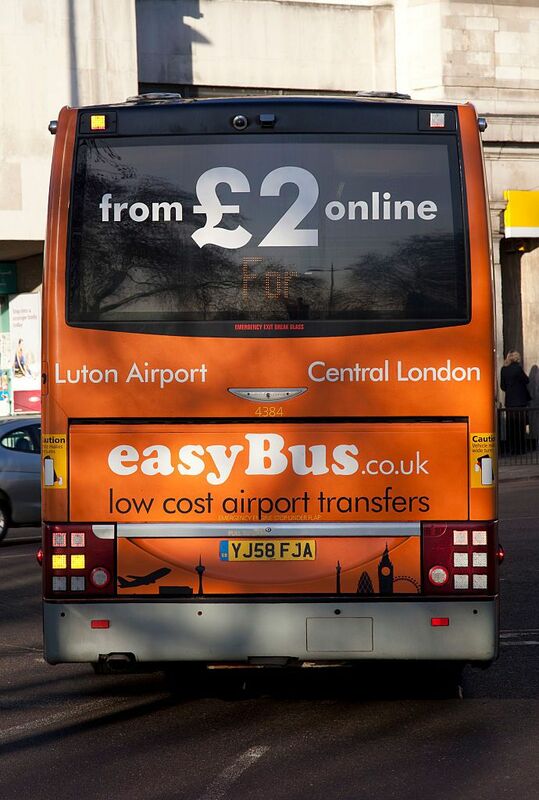 easyBus provides low-cost airport transfers to and from Gatwick Airport, Stansted Airport and Luton Airport from just £2 one way. It's the cheapest way to travel between London and three of the city's main airports. It's the cheapest way to get to Gatwick, Stansted, and Luton. The buses are clean and efficient. All passengers can use this service. You don't have to be boarding an easyJet flight. You need to plan ahead to get the best deal. You can't take much luggage (usually one piece of hand baggage and one piece of checked luggage). The buses are pretty small, so they're not ideal for large groups. London traffic can be unpredictable. It's best to book online in advance. You'll likely get a ticket for less than £5 whereas on-the-day cash fares can be double that. As Easyjet is a low-cost carrier that charges for checked luggage, most easyBus passengers travel with hand luggage only. The 19-seater buses may be small but they are clean and efficient, especially as no food or drink is allowed on board. The easyBus website is simple to use and it is always worth booking tickets online, even if you only decide on the day, as cash fares are always higher and you are not guaranteed a seat on the bus. Depending on the route, easyBus use coaches or small 19-seater buses. The smaller buses obviously don't have as much luggage storage but this never seems to be an issue as most people are seen using easyBus are traveling with hand luggage only. Luggage has to be stored away so you won't have access to it throughout the journey. Be prepared with your book, iPod, etc. in your pockets before getting in line to board. The buses are clean (you're not permitted to take food and drink on board) and the drivers are efficient and generally friendly. The buses have comfortable seats and are air-conditioned. While trains can run to a departure and arrival timetable, road services can be subject to traffic delays so always allow extra time for your journey. Arrive early at your pick-up point as the bus will leave at the scheduled time so that means loading luggage and passengers in the 10 minutes before departure. Generally, if you're traveling light, book online, and allow extra time in case of traffic delays, this is a fine service to choose.